Kevin: Yes it was a busy night of TV. UFC certainly suffered the most. I got to The Walking Dead after the expected finish of WWE Fastlane. Jeremy: You mean the end was utterly predictable along with the crowd reaction? No way! Kevin: Well, the end was a bit surprising. No Wyatt interference was a bit of a surprise to me. I’ll go back to the well too, they’ve been building Reigns vs HHH for months. Predictable isn’t always bad. Will it be best match on the card, doubtful. Will it be good to great, yep. Jeremy: Predictable is bad when it is something the majority doesn’t want. I am figuring it isn’t the main event. Still talk of Undertaker’s last match and if so no way that isn’t the final match. Just hoping Seth can get back in time and be a part of it somehow. Kevin: I think the crowd is more split a la John Cena more than straight pooping on the story. Plus, I can’t believe you’re taking Cleveland’s crowd response as something that should be taken seriously. Jeremy: It hasn’t been just Cleveland, Philly was the high point. been back to boos and muddled response since. Dean is getting the pops now. Whether I like him or not it is pretty clear. Not sure what saves the main event but it is a weak one. they have 6 weeks though. They pulled off a shocker last year so hoping for some more magic. Re-watching the last hour or so of the PPV. Good lord this edge and christian segment died a slow death. Two things before Walking Dead…….Big Show press slamming/tossing Harper over the top rope was crazy cool. 2: I had no doubt Roman was winning. Doesn’t mean I dislike Roman though. Also, a very good main event. Kevin: I don’t think you blow up a logical story for the pops that Ambrose is getting. While people are more behind Dean, he’s not exactly getting a Daniel Bryan level reaction. Jeremy: If you can make a better story you do. No one is gettin a Daniel Bryan reaction. Literally no one on that level now. Kevin: What’s your story? I’m just getting tired of fighting for logic. Not sure why people want to toss it out the window so badly. Jeremy: Logic and reason change when circumstances and results are apparent. The logical conclusion isn’t always the one you expected. Kevin: What’s your logical reason to have Ambrose face HHH? Jeremy: Don’t have one. Could probably come up with it if I thought for a minute. Kevin: Exactly. So, it did seem to me a lot of logic was used in The Walking Dead this week, even if some of the logic caused people a lot of heart burn. Kevin: Yes, it was a pretty strange episode. It was pretty entertaining which I don’t think of even in their lighter episodes. Not sure I’ve laughed that much for this show. It all started with the requests Daryl was getting from both the Denise and Eugene. Kevin: Hahaha. Definitely another part before the credits even hit that made me laugh. Daryl certainly made it sound like it wasn’t the first time Rick wanted to play that tape. Jeremy: The time jump wasn’t explained the best. On Talking Dead, Danai Gurira said it had been two months. The passage of time was evident since the town was clean and walls extended. So, Daryl and Rick clearly have been on it before. They even mentioned how they haven’t seen anyone. This all helped with their bonding and humor with each other. Kevin: They did mention it in passing but it could have been spelled out a bit better. 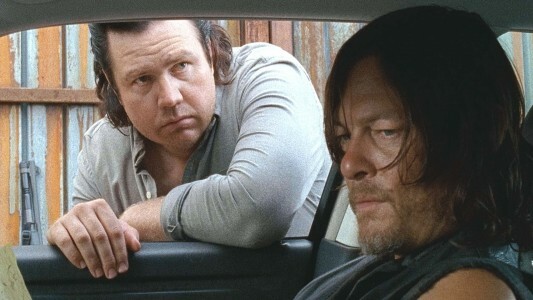 I was trying to think of the next funny thing and I believe it had to be the introduction of Paul as Daryl is trying to get “pop” for Denise & Tara. Jeremy: Yes the joke that is probably lost on the western part of the country. Down here everything is a Coke. Why? No clue other than Atlanta being the headquarters. Probably some brainwashing. Anywho, it did show that at least things have eased a bit. Plus it made me think why Daryl and Rick didn’t go on all of the runs. They find a truck of food and no one died. Kevin: Oh man, I didn’t even think of that aspect. No walkers were left living so that something calamitous could happen later in the episode either. Jeremy: Well outside the two that have spiked themselves out side the wall. Then someone chained and roped those three on the abandoned pick up truck. Yes I know they lost the truck because they decided to off road but no one died at least. Kevin: All part of the law of averages, which again brought a lot of humor to the show. Jeremy: Even Jesus was sort of comical in his nonchalant attitude. A stark contrast form the weak, scared or terrible people they have run across. Kevin: Paul aka Jesus was an interesting mystery. He didn’t try to kill Daryl or Rick but he clearly had some skill which made me wonder why Rick only had one person looking over him after they got back to Alexandria. I know Daryl is very capable but Paul kick both of their asses and tricked them a few times during their adventures. Jeremy: He was bound still but Rick did say the knots were loose. They also left him water and a note. His clear skills should have been a red flag but it is this show. Rick was more forgiving and Jesus helping them out had to count for something. He was slick and really that’s all we know so far. Even though Rick correctly pointed out how clean he was. Kevin: Jesus certainly seemed to have some type of home but it wasn’t with the group of people he warned Daryl & Rick about in the first confrontation. Jesus did put up with quite a beating too including being dropped off the roof of a large van. Jeremy: They went slapstick. As soon as they left him behind ya knew he was on that truck in some way. Also can’t forget asking if they even had ammo in the guns. I liked the matter of fact reaction. He is going to be an interesting addition if he sticks around past next week. I am figuring he was out on a supply run as well. Kevin: It was interesting that Negan was never brought up even though it should have been between Daryl & Rick. I’m sure you wouldn’t want to tip your hand to some guy you didn’t know. Jeremy: With the time jump you have to wonder if there was talk between Daryl and Rick/ the group about Negan, there was the sign outside of Alexandria now and I think his name may be the reasoning. Kevin: I would think that did occur but I suppose I was wondering why that wouldn’t play into whether you accepted someone or not. Rick noting that the guy was cleaned up would lead me to not accepting someone. If you find some grungy, that’s the type of person you bring in. Jeremy: Part of the strategy may be to keep an eye on him as well. I understand this goes back to the problem of leaving Daryl on him by himself. Kevin: Now, I suppose we can move along to the other small story line before getting to the end of the show. So was it a surprise that Deanna was still alive as a zombie? Jeremy: I thought Deanna was a eaten, guess she got moves. Speaking of moves, Carl needs to up his game. Kevin: Enid seems to realize Carl is the only game in town now and he was just blowing her off. Not sure how a kid his age would do so. Jeremy: Well he chased her long enough, let her sit and stir trying to figure out why he is being standoffish. Gotta play hard man. I think that’s everything right? Nothing else go on? Kevin: Ha. I was just trying to extend the time until we got to Rick & Michonne hooking up. I’ve got to admit, I wasn’t surprised by that. From the moment they made a point of still living together, I expected that to happen. Jeremy: Lets start at the beginning; when they moved in to Alexandria I had no idea they were in same house. So opening the episode with her in a robe and towel over hair I was thinking they hooked up. Then they were both goofing with Carl and I thought, nah, she just was there? Kevin: See, I felt like they mentioned Michonne living in the same place as Rick & Carl after they all got settled in at Alexandria and people moved to their own places. They never made a big deal of it but that’s what my memory is telling me. Jeremy: Right once they were in things went to garbage anyway so never had a chance to explore that. But this was part of the episode that was so strange. There was a definite flirt session there. I never saw the romantic thing other fans had been calling for. I always thought of their relationship as equals. Warriors fighting together that lead to a huge mutual respect. Kevin: Your logic is the exact reason I thought they’d get together. Who is Michonne going to hook up with? One of the townies who hasn’t been introduced? Morgan isn’t happening since he’s a peacenik. I could have seen Tyreese at some point but we know that isn’t happening. Daryl doesn’t really seem like a candidate to me. I guess maybe Abraham but he’s got his hands on two other women already. Jeremy: I believe in the comics Michonne did hook up with Tyreese. You would think townsfolk would start shacking up by now. Denise and Tara even seemingly got together. The show has put love on one specific set of characters and that was Glenn and Maggie. having that focus shift was interesting and opens the show up for a more. Kevin: Maggie & Glenn have lost a lot of their shine for an extended period except for the “Did Glenn die?” whodunnit last half season. But it has opened things up for everyone else. Jeremy: Obviously the peace isn’t going to last, especially with the preview for next week as they leave Alexandria but it was something rarely explored. I do enjoy the fact they hook up, was that their first time, and they still get no peace as Jesus shows up. Kevin: I enjoyed the “artwork” shot they had of Michonne & Rick with proper pieces covered and Michonne awkwardly having her arm draped across Rick’s chest. I was in no way surprised both of them had their weapons at the ready when Jesus showed up. He did tell us to be prepared for his coming at any hour in the Bible. Jeremy: He even told them “We need to talk” that’s such a Jesus thing to do.